A battle of brain and byte, the Singapore-India Hackathon concludes with ideas for a smarter campus. Twenty teams from universities across the two countries participated in the competition jointly organised by NTUitive Pte Ltd, the innovation and enterprise company of Nanyang Technological University (NTU), and All India Council for Technical Education (AICTE). A first of its kind, it was Indian Prime Minister Narendra Modi’s idea. He had suggested it during his official State visit to Singapore in June this year. Each team comprising of three members were tasked to build innovative tech solutions for a “Smart Campus”. Original ideas had to be fielded within 36 hours. Teams could explore how to navigate a campus efficiently outdoors and indoors, enhance learning using technology, manage an individual’s digital identity, and more. The winning team from NTU Singapore proposed a community-based learning platform. Student users can collaborate on the platform and engage in mutual learning. Moreover, the platform offers professor-approved answers to solution sets for past year papers. India’s winning team, IIT Kharagpur Team2, suggested an idea for campus navigation. Using Augmented Reality, the navigation app helps users find their way indoors. The app can also be integrated with Google Maps. Other winning teams proposed ideas to improve parking on campus using a video analytic solution which tracks vehicles and geotagging, and effective learning. The geotagging solution was by Team KillerKode from MIT College of Engineering, Pune. Coming in third place, their solution was a novel one since parking management was aided with “Sound QR” technologies as well. Their Singaporean counterpart, Team Rakshacam from Singapore University of Technology and Design, used video analytic solution to track vehicles in carparks. The solution can potentially provide users information regarding where their vehicles are located. Team Rakshacam also bagged second runner up. The top prize valued at SGD 10 000. Second and third prize-winners were awarded SGD 6000 and SGD 4000 respectively. Presenting the awards at ceremony were PM Modi and Singapore’s Education Minister Mr Ong Ye Kung. NTU President Subra Suresh was also in attendance. The quality of submissions impressed the judging panel. The competition was held between 12th to 14th November 2018 at NTU. 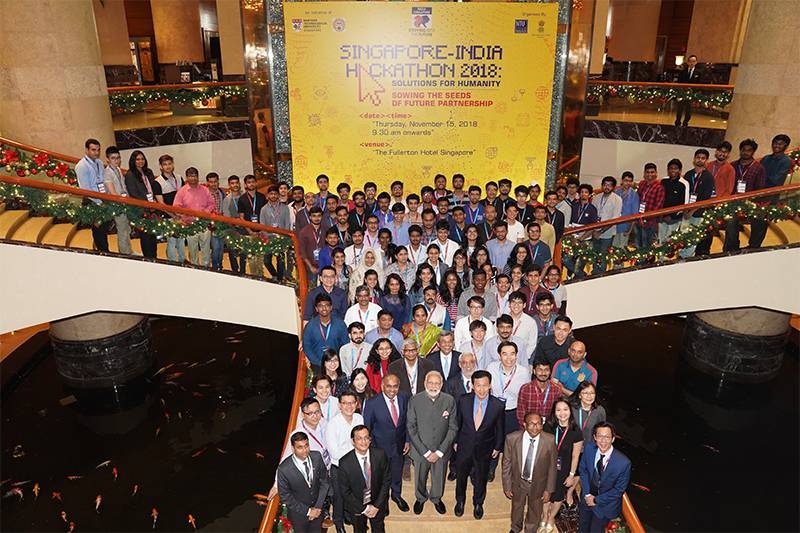 The High Commission of India in Singapore facilitated the Singapore-India Hackathon in collaboration with the Ministries of Education and Foreign Affairs of Singapore.